On November 6, 1860, the six-year-old Republican Party elected its first president. During the tense crisis months that followed — the “secession winter” of 1860–61 — practically all observers believed that Lincoln and the Republicans would begin attacking slavery as soon as they took power. Democrats in the North blamed the Republican Party for the entire sectional crisis. They accused Republicans of plotting to circumvent the Constitutional prohibition against direct federal attacks on slavery. Republicans would instead allegedly try to squeeze slavery to death indirectly, by abolishing it in the territories and in Washington DC, suppressing it in the high seas, and refusing federal enforcement of the Slave Laws. The first to succumb to the Republican program of “ultimate extinction,” Democrats charged, would be the border states where slavery was most vulnerable. For Northern Democrats, this is what caused the crisis; the Republicans were to blame for trying to get around the Constitution. Southern secessionists said almost exactly the same thing. The Republicans supposedly intended to bypass the Constitution’s protections for slavery by surrounding the South with free states, free territories, and free waters. What Republicans called a “cordon of freedom,” secessionists denounced as an inflammatory circle of fire. The Southern cooperationists — those who opposed immediate secession — agreed with the secessionists’ and Northern Democrats’ analysis of Republican intentions. But they argued that the only way the Republicans would actually have the power to act on those intentions was if the Southern states seceded. If the slave states remained within the Union, the Republicans would not have the majorities in Congress to adopt their antislavery policies. And if the South did secede, all bets would be off. The rebellious states would forfeit all the constitutional protections of slavery. The South would get something much worse than a cordon of freedom. It would get direct military intervention, leading to the immediate and uncompensated emancipation of the slaves. The slaves themselves seem to have understood this. They took an unusual interest in the 1860 election and had high hopes for what Lincoln’s victory would mean. They assumed that Lincoln’s inauguration would lead to war, that war would bring on a Union invasion of the South, and that the invading Union army would free the slaves. But to read what historians have been saying for decades is to conclude that all of these people — the Democrats, the secessionists, the cooperationists, and the slaves — were all wrong. The Northern Democrats were just demagogues. The secessionists were hysterical. And the slaves were, alas, sadly misguided. Unwilling to take seriously what contemporaries were saying, historians have constructed a narrative of Emancipation and the Civil War that begins with the premise that Republicans came into the war with no intention of attacking slavery — indeed, that they disavowed any antislavery intentions. The narrative is designed to demonstrate the original premise, according to which everyone at the time was mistaken about what the Republicans intended to do. It’s a familiar chronology: Under the terms of the First Confiscation Act of August 1861, disloyal masters would “forfeit” the use of their slaves, but the slaves were not actually freed. Lincoln ordered General John C. Frémont to rescind his decree of that September freeing the slaves of rebels in Missouri, and several months later the President rescinded General Hunter’s order abolishing slavery in three states. As late as the summer of 1862, we are reminded, Lincoln was writing letters to Horace Greeley saying that if he could end the war without freeing a single slave, he would do so. 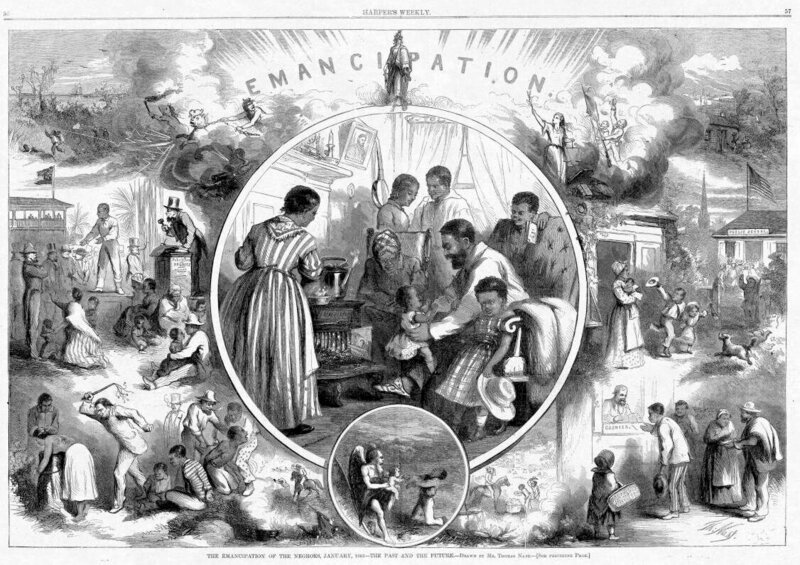 Even after the President finally promised an emancipation proclamation, in September 1862, several months elapsed until the proclamation actually came on January 1, 1863. Only then, according to the standard narrative, was the North committed to emancipation. Only then did the purpose of the Civil War expand from the mere restoration of the Union to include the overthrow of slavery. In one form or another, this narrative is familiar to all scholars of the period. Historians who agree on little else will agree on this version of the story, even when they have entirely divergent interpretations of what it means. But what if the original premise is wrong? What if, during the secession winter of 1860–61, everybody was right about what the Republicans intended to do about slavery? What if the Republicans came into the war ready and willing to destroy slavery? What does that do for a narrative of emancipation? For one thing, it flies in the face of the prevailing neo-revisionism in contemporary Civil War scholarship. The old revisionist interpretation, which reached its zenith of influence in the 1930s and 1940s, came in many varieties. But it always rested on an essentially negative proposition: whatever else the war was about, it was not about slavery. This viewpoint required one set of claims about the South, and another about the North. Revisionists claimed that slavery was already dying in the South, that it was unprofitable, that it wasn’t important to Southern economy and society, that it had reached the natural limits of its expansion, and that Southern leaders were more concerned about defending state rights than protecting slavery. Most contemporary historians, though not all of them, now reject these old revisionist claims. Slavery was thriving and the Southern states seceded to protect it. But revisionists also claimed that the North did not go to war over slavery. If there were “interests” involved, they were the interests of Northern capitalists against Southern agrarians. The Civil War was an accident brought on by bungling politicians. The abolitionists were a tiny, beleaguered minority; most Northerners shared the general conviction of black racial inferiority. The South had slavery, the argument went, but the North was racist too. This argument, in turn, was really just a revival of the antebellum Democratic Party’s relentless efforts to shift the terms of debate from slavery to race. Contemporary scholarship is saturated by this neo-revisionist premise. Like the antebellum Democrats and the Civil War revisionists, neo-revisionists have insistently shifted the terms of the debate from slavery to race. Virtually any Republican in 1860 would have recognized this argument as Democratic Party propaganda. If I sound skeptical, that’s because I am. On the basis of my research, I can no longer accept the thesis that the Union did not begin emancipating slaves until January 1, 1863. It was never my intention to overturn the conventional narrative. I began by accepting the standard assumption that that the first Confiscation Act achieved nothing. But I still wanted to know what Republicans thought they were doing when they passed the law. Why did the Act turn out to be so toothless? Why did it fail to free any slaves? Secondary accounts usually pass over this question; they couldn’t provide me with the answers I needed: who wrote the law, where did it come from, how did people talk about it? To my astonishment, I discovered that Section Four of the Act, the clause specifically authorizing the forfeiture of slaves, was written by Senator Lyman Trumbull, chair of the Judiciary Committee, as an emancipation clause. Indeed, it was understood by everyone in Congress to be an emancipation clause. Trumbull’s proposal was denounced by Democrats and border-state congressmen as an emancipation clause, defended almost unanimously by congressional Republicans as an emancipation clause. These men thought they were writing an emancipation bill. That’s what they said at the time. A full-scale congressional debate erupted in July of 1861, focusing on the legitimacy of the emancipation that Republicans were undertaking. When I read those debates I wondered where the arguments for emancipation had come from. I went back to the secession debates. And sure enough, everything critics had accused the Republicans of planning to do was exactly what Republicans themselves were saying they were going to do. The great mistake that historians have made, I realized, was a misreading of the constitutional premises of the Republican antislavery agenda. I doubt anything Lincoln said is more commonly repeated by historians than the promise he made in his inaugural address not to interfere with slavery in the states where it already existed. That little quotation is all the proof historians seem to require to demonstrate that when the war began, neither Lincoln nor the Republicans had any idea of emancipating slaves. In fact, nearly every abolitionist (and just about every historian I can think of) would agree with Lincoln: the Founders had made a series of compromises resulting in a Constitution that did not allow the federal government to abolish slavery in any state where it existed. William Lloyd Garrison wrote that consensus into the founding document of the American Anti-Slavery Society, the 1833 Declaration of Sentiments, which flatly declared that the power to abolish slavery rested exclusively with the states. Theodore Dwight Weld said the same thing. So did Joshua Giddings, Salmon Chase, and Charles Sumner. The federal government had no power to interfere with slavery in the states where it already existed. Which raises the obvious question: how did the abolitionists expect to get slavery abolished? A small group of nonpolitical abolitionists argued for moral suasion. An even smaller faction of antislavery radicals argued that the Constitution was an antislavery document. But most abolitionists believed, on the one hand, that the Constitution did not allow the federal government to abolish slavery in the states, but that on the other hand, political action was necessary for slavery to be abolished. Given the Constitution’s restrictions, what did opponents of slavery think could be done? Coming out of the 1860 election, Republicans declared that there were two possible policies. The first was to make freedom national and restrict slavery to the states where it already existed. Republican policymakers would seal off the South: they would no longer enforce the Fugitive Slave Clause; slavery would be suppressed on the high seas; it would be abolished in Washington DC, banned from all the Western territories, and no new slave states would be admitted to the Union. A “cordon of freedom” would surround the slave states. Then Republicans would offer a series of incentives to the border states where slavery was weakest: compensation, subsidies for voluntary emigration of freed slaves, a gradual timetable for complete abolition. Slavery was intrinsically weak, Republicans said. By denationalizing it, they could put it on a course of ultimate extinction. Surrounded on all sides, deprived of life-giving federal support, the slave states would one by one abolish slavery on their own, beginning with the border states. Each new defection would further diminish the strength of the remaining slave states, further accelerating the process of abolition. Yet because the decision to abolish slavery remained with the states, Republican policies would not violate the constitutional ban on direct federal interference in slavery. The South would simply have to accept this. And if it couldn’t tolerate such a federal policy, it could leave the Union. But once it seceded, all bets would be off — it would lose the Constitutional protections that it had previously enjoyed. The Republicans would then implement the second policy: direct military emancipation, immediate and uncompensated. Republicans said this openly during the secession crisis. And that’s what they were saying in Congress as they debated the Confiscation Act. It’s time to start rethinking our fundamental assumptions about the causes as well as the trajectory of the Civil War. And we can start by taking the perceptions of its contemporaries a great deal more seriously.